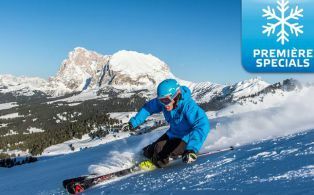 Our holiday apartments are located at the foot of Schlern Mountain and Seiser Alm, the biggest high-alpine plateau in Europe amidst the Dolomites, a UNESCO World Natural Heritage site. 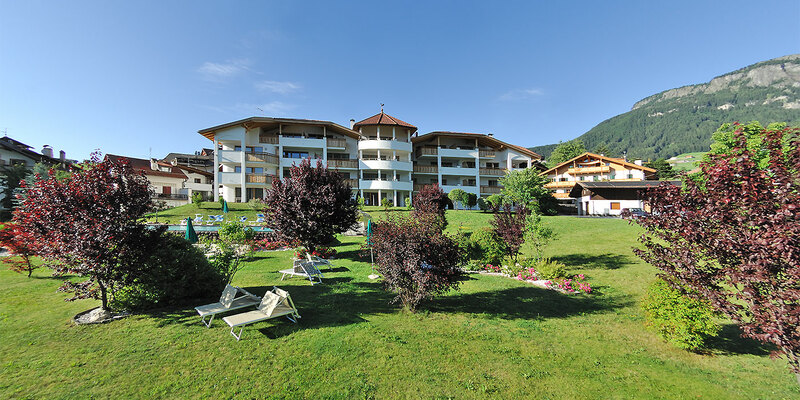 Our Residence is located in the village centre of Seis am Schlern in a wonderful, quiet and sunny position. Enjoy a wonderful time in our spacious and modernly furnished apartments with one or two bedrooms, and south-facing balcony or terrace. 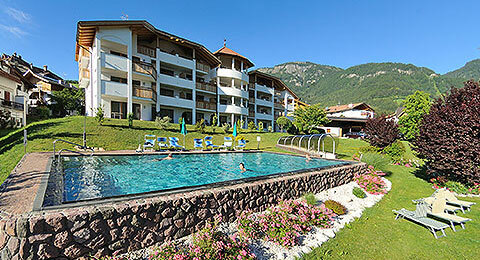 Residence Nussbaumer provides the ideal starting point for varied activities during all seasons of the year. The Seiser Alm cable cars are only a few minutes' walk from our Residence. The shuttle busses to the cable cars and the public bus stop are only a few steps away. The outdoor pool with a breath-taking view of the mountains and vast garden with sunbathing lawn, and the indoor pool with Jacuzzi and several saunas are ideal for forgetting the hustle and bustle of everyday life. In summer, you can discover the imposing landscape of Seiser Alm and the fascinating mountain world of the Dolomites during a hike. 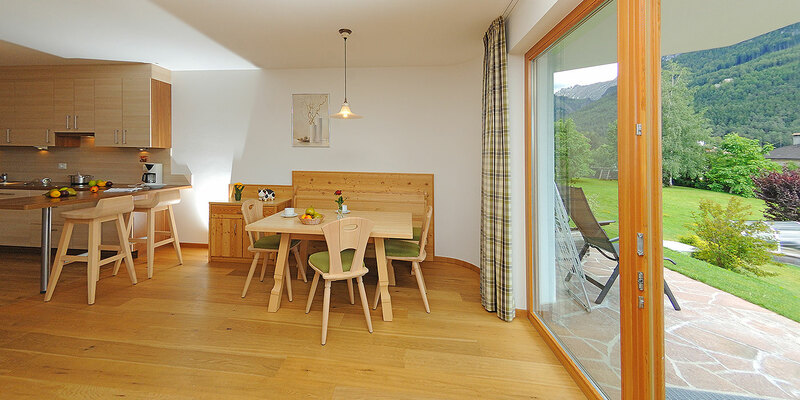 Our holiday apartments provide the ideal starting point for the most beautiful and renowned hiking tours in the surroundings and on the Seiser Alm plateau. 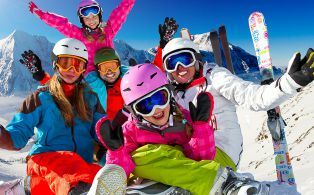 In winter, the Seiser Alm ski resort - one of the most beautiful ski resorts in South Tyrol - can be easily and quickly reached with the Seiser Alm cable cars near our holiday apartments in Seis am Schlern. The Seiser Alm cable cars are only 10 minutes' walk or 3 minutes with the shuttle bus (bus stop 50 m away) from the Nussbaumer Apartments. 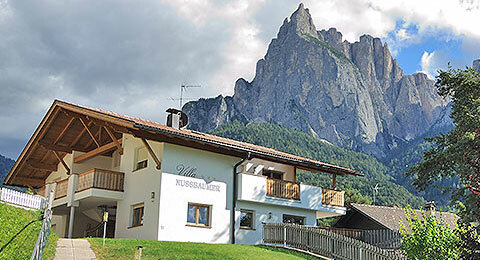 After an exciting active day in the Dolomites, you can relax in the beautiful wellness area of Residence Nussbaumer and gain new energy for your next excursion on Seiser Alm! Increase your wellbeing and find recreation in the different saunas of Apartments Residence Nussbaumer. 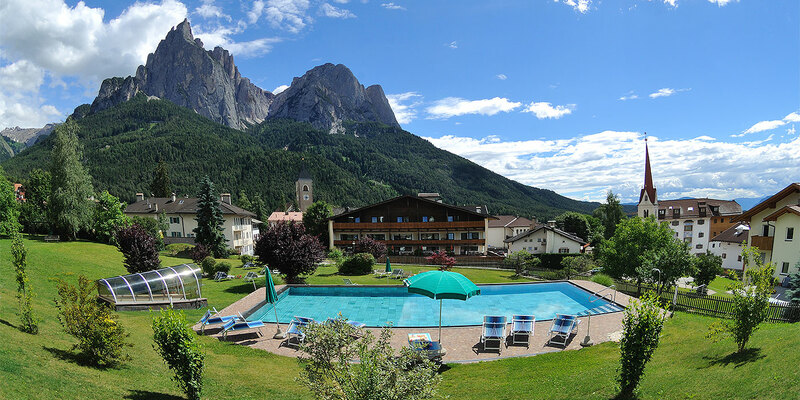 In summer, you can enjoy a swim in the outdoor pool of Apartments Residence Nussbaumer while enjoying a spectacular view of Schlern Mountain! The spacious garden with sunbathing lawn is ideal for relaxing. 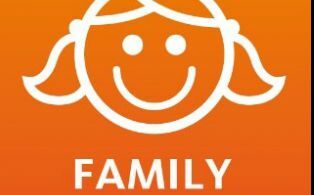 Children will enjoy the playground with slide, swing and table tennis. The public playground is only 100 m from the Residence. You can reach the Seiser Alm cable cars within a few minutes' walk. 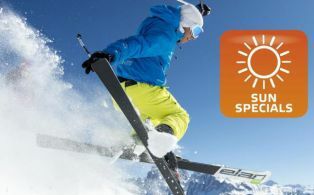 The shuttle busses and public busses stop only a few steps from Apartments Residence Nussbaumer in Seis (50 m and 100 m). You see… the best prerequisites for an independent and unforgettable vacation in our Apartments at the foot of Seiser Alm in the Dolomites! 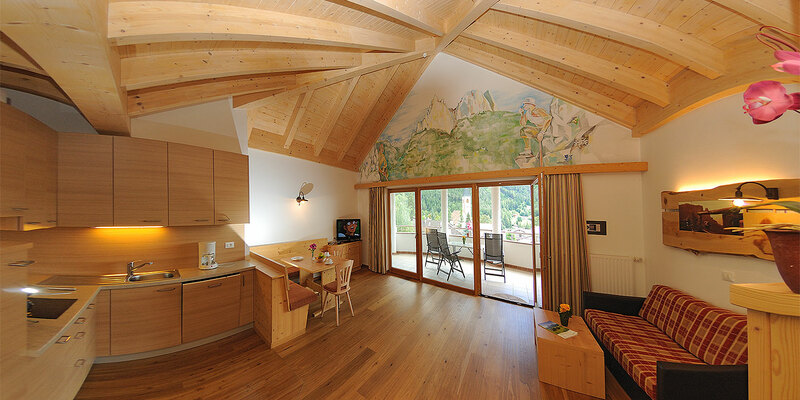 We look forward to your visit in our spacious, modern and comfortably furnished holiday apartments in Seis am Schlern!